Starting from this viewpoint, Bahá’ís have created a junior youth empowerment program to help people of this age group develop their intellectual, moral and spiritual capacities. While the JY program is inspired by Bahá’í spiritual principles, it is open to young people of all faiths between the ages of 11 and 15. The program's focus is to apply universal spiritual principles to the challenges faced by young people. During JY sessions, participants develop their powers of expression, their ability to solve problems and their capacity to be of service to humanity. What happens in junior youth groups? Participants develop these capacities through a combination of activities. The program seeks to create a warm social atmosphere in which the participants feel welcomed, accepted and respected. Junior youth participate in the art, music, storytelling and cooperative games. 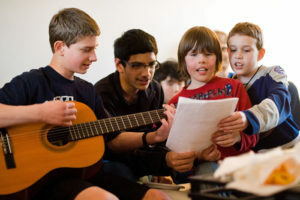 These activities help them to develop their powers of expression and to bond with others in the group. The participants read, reflect upon and discuss stories about young people from different parts of the world. They can think about how to apply the spiritual principles found within these stories to real-life problems. The junior youth come up with ideas for community service projects and carry them out themselves. In so doing, they develop their capacity to consult with others, solve problems and be of service to humanity. Older adolescents and young adults assist the junior youth as "JY animators." However, it is the junior youth themselves who take the initiative in group projects. The junior youth empowerment program is designed to help youths between the ages of 11 and 15 to "develop into focused, happy and productive teenagers and young adults." For more information about how to join the program or become an animator, email the Northeast Avalon Junior Youth Team at junioryouth.nl@gmail.com or call Robert at 709-221-1873. More than 500,000 people worldwide have participated in the Junior Youth Empowerment Program - including these junior youth in Vancouver.